In 1648, two Virginia slaves, Philip Mongon and Domingo Mathews, were loaned by their owner to one of his creditors, for a term of four years. Unfortunately, they “were very stubborn and would not follow his business.” Eventually they refused to work at all, until their owner provided a written agreement stating that if they worked for the four years, they would be freed. Several years later Mongon was brought to court for stealing hogs, and acquitted, but fined one hundred pounds of tobacco for throwing some hogs’ ears on the judges’ table during the trial. 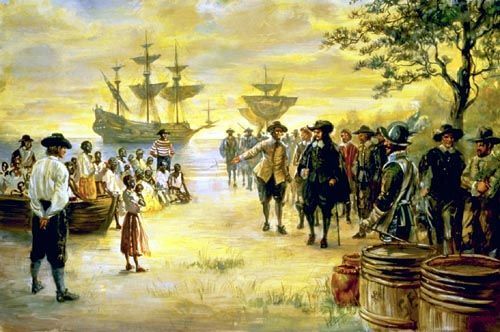 Mongon and Longo, both landowners and married to English women, were members of the first or second generation of African-Americans, Portuguese subjects captured in Angola and brought to Jamestown as slaves in 1619. For a brief moment, in the first two generations of Virginia settlement, they were treated more or less like their white peers who arrived as indentured servants. Some were freed at the end of a normal period of indenture. Others were allowed to own livestock and grow their own tobacco, and often saved enough money to buy their own freedom. They served in the militia, wearing swords and armor and carrying guns. Some of them owned African slaves and white indentured servants. They quarreled with their white neighbors and drinking companions, abusing and insulting them without a trace of deference. And then it ended. In the last quarter of the 17th century, the doors began to close. As the Virginia slave system settled into its permanent shape, little by little the free people of color lost their legal rights. In 1682, they lost the right to bear arms. In 1699 manumission was severely restricted. In 1705 intermarriage was forbidden, and free people of color were denied the right to testify against whites in court, or to hold any civil or military office. In 1723, they lost the right to vote or serve on juries. It was only in the remote border areas, where social institutions were still weak and settlers had to depend on their own efforts and the help of their neighbors in order to survive, that the descendants of these free people could find a place where the restrictive laws were ignored and they were treated, to a limited extent, like fellow human beings. In each case, that freedom lasted for no more than a generation, after which they had to move again, west or south towards the next border. The Birth of Black America, by Tim Hashaw, gives a lively and detailed picture of those early African Americans, their strange voyage to America, the intrigues in the British court that brought them there, and the reasons for their catastrophic decline in status. Paul Heinegg’s extraordinary website, www.freeafricanamericans.com, traces the lives of their descendants – the ancestors of hundreds of thousands of today’s “white” Americans. What did it mean to be a “trained doctor” in the 18th century?